by James R. Holmes | The Diplomat. With a new directive China has appointed itself the sheriff over most of the South China Sea. Associated Press reporter Christopher Bodeen chooses his words well in a story on China’s latest bid to rule offshore waters. Beijing, he writes, is augmenting its “police powers” in the South China Sea. That’s legalese for enforcing domestic law within certain lines inscribed on the map, or in this case nautical chart. A few quick thoughts as this story develops. One, regional and extraregional observers shouldn’t be too shocked at this turn of events. 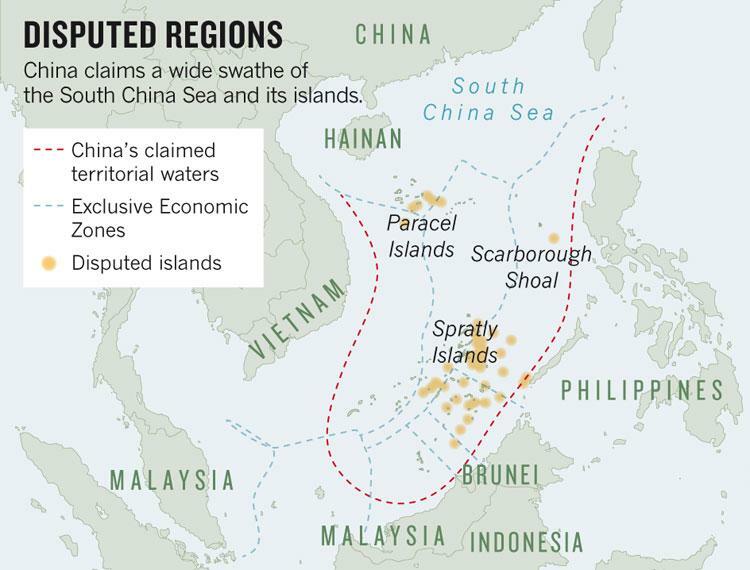 China’s claims to the South China Sea reach back decades. The map bearing the nine-dashed line, for instance, predates the founding of the People’s Republic of China. It may go back a century. Nor are these idle fancies. Chinese forces pummeled a South Vietnamese flotilla in the Paracels in 1974. Sporadic encounters with neighboring maritime forces — sometime violent, more often not — have continued to this day. (See Shoal, Scarborough.) Only the pace has quickened. Henry Kissinger notes that custodians and beneficiaries of the status quo find it hard to believe that revolutionaries really want what they say they want. Memo to Manila, Hanoi & Co.: Beijing really wants what it says it wants. Two, Bodeen’s police-powers terminology is apt. Lawyers define the police power as a twofold thing. It means enforcing order on national territory, in the usual sense of the word police. And it means helping provide for the health, welfare, and morals of the people. The new rules fall into the former category. China is trying to enforce its laws in waters and islands over which it asserts sovereignty, as though the question of sovereignty is a done deal. And it is using non-military assets, not the PLA, to punctuate its message that there are no legitimate challenges to Chinese jurisdiction. This is what I’ve been calling “small-stick diplomacy” for the past couple of years. China’s small stick — the China Coast Guard and other law-enforcement instruments — outmatches Southeast Asian militaries by most measures. So why not police contested sea areas with inoffensive-seeming vessels while holding the big stick, the PLA, in reserve should things go wrong? If no one pushes back effectively, you create a new normal over time. Three, in all likelihood Hainan lawmakers’ diktat presages no challenge to freedom of navigation, the stated U.S. interest in the region. Chinese spokesmen take pains to disavow any such challenge. But for them, navigation means navigation and nothing more. Barring foreign fishing vessels from select areas means compelling their home governments to accept Chinese domestic law in waters under dispute. And that’s the goal, isn’t it? 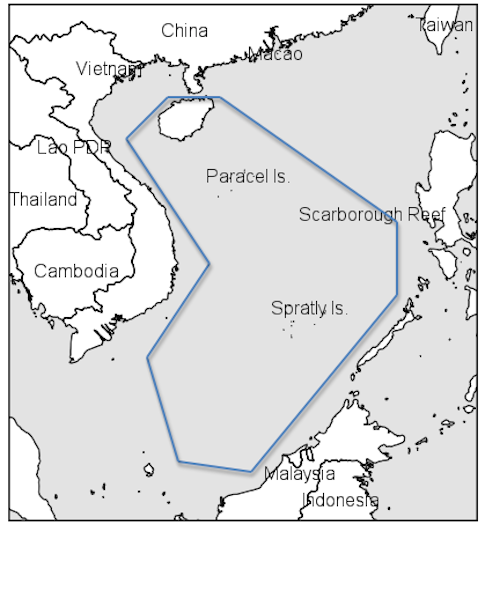 In effect Beijing wants foreign shipping, private and publicly owned, to obey the same rules the law of the sea ordains for the 12-nautical-mile territorial sea. That’s the offshore belt where the coastal state’s laws and regulations apply with the same force they do ashore. This adds up to selective access denial. China, that is, will make the rules governing access to seas it deems its own — and others will comply. But four, the South China Sea is a huge waterspace for any force to police. Bodeen estimates the area covered by the new rules at 1.35 million square miles. That’s five times the land area of Texas. And everything’s big in Texas, as denizens of that state will tell you (over and over again). Readers of these pixels are familiar with J. C. Wylie’s axiom that the man on the scene with a gun — Wylie’s metaphor for armed assets of various types — is the true guarantor of control over a given territory. Does China boast enough seagoing policemen to monitor what’s happening throughout two-thirds of the South China Sea, and shoo away or apprehend those who defy Chinese law? Color me skeptical. Which means enforcement efforts may be scattershot, PLA assets may have to pick up the slack for law-enforcement services, or both. Deploying military assets to police supposedly sovereign islands and waters would crimp the narrative that China exercises indisputable sovereignty there. So would widespread disobedience. It’s hard to envision Southeast Asian governments — heck, any government with a stake in the maritime order — accepting what Beijing is pushing. What if China passed a law and no one obeyed? We may see. by Greg Torode | Reuters – The Philippines’ legal challenge againstChina‘s claims in the South China Sea is gathering pace, emerging as a “proxy battle” over Beijing’s territorial reach. Manila has assembled a crack international legal team to fight its unprecedented arbitration case under the United Nations’ Convention on the Law of the Sea – ignoring growing pressure from Beijing to scrap the action. Any result will be unenforceable, legal experts say, but will carry considerable moral and political weight. The Philippines has invested a “huge amount of political capital in this legal gambit and it wants to ensure success regardless of the cost,” said security scholar Ian Storey of Singapore’s Institute of South East Asian Studies. “If the Philippine team submits a less than convincing case…this would be very embarrassing for Manila and put it right back to square one in its dispute with China. Beyond the legal questions, the case carries political and diplomatic risks and is being closely watched by Japan and Vietnam, locked in their own disputes with China over sea territory, officials from both countries say. The United States, which is deepening military ties with the Philippines, a longstanding treaty ally, is also watching. The legal battle mirrors tensions at sea, where China and the Philippines eye each other over rival occupations of the Scarborough and Second Thomas shoals. Chinese vessels occupied Scarborough after a tense two-month standoff between rival vessels last year – a move some regional analysts have described as an effective annexation by Beijing. The Philippines accused China of further encroachment when a naval frigate and two other ships steamed within five nautical miles of a dilapidated transport ship that Manila ran aground on Second Thomas Shoal in 1999 to mark its territory. Overlapping claims in the South China Sea – traversed by half the world’s shipping tonnage – are one of the region’s biggest flashpoints amid China’s military build-up and the U.S. strategic “pivot” back to Asia. The claims of the Philippines, Vietnam, Malaysia and Brunei are bisected by China’s “nine-dash line” – the historic claim that reaches deep into the maritime heart of Southeast Asia. European states, Russia, India and South Korea are also monitoring events, given the sea’s shipping lanes and potential oil and gas resources, diplomats and military officials say. Frustrated by slow progress by the Association of South East Asian Nations in easing tensions and fearing its sovereignty was threatened, Philippines officials said they had no alternative. Unable to contest actual sovereignty in international courts without China’s consent, Manila instead launched its arbitration in January – despite formal objections from Beijing. Philippines Foreign Ministry spokesman Raul Hernandez told Reuters this week that Manila remained positive that the action would clarify the claims and entitlements of claimants to “benefit the region and the international community as a whole”. Manila’s team is preparing arguments to show that the nine-dash line claim is invalid under of the Law of the Sea. They are also seeking clarifications of the territorial limits, under the law, of rocks and shoals such as Scarborough – all part of a bid to confirm the Philippines’ rights within its 200-nautical-mile exclusive economic zone. Philippines’ lead counsel Paul Reichler, a Washington-based lawyer with Foley Hoag, told Reuters that his five-strong team included British law professors Philippe Sands and Alan Boyle as well as Bernard Oxman from the University of Miami’s law school. Independent legal experts have described the team, managed by the Philippines’ Solicitor General Francis Jardeleza, as “formidable”, with deep experience of the arcane world of the Law of the Sea, a landmark document approved in the early 1980s. China has refused to participate, saying the case has “no legal grounds”, and is widely expected to reject any outcome its does not agree with. Foreign Ministry spokesman Hong Lei said China views the move as a breach of a 2002 declaration between China and ASEAN. “The Philippines has illegally occupied the reefs and islands in the South China Sea that belong to China…China has consistently advocated for resolution to the dispute at hand through bilateral dialogue,” he said. Behind the scenes, Chinese diplomats are telling the Philippines’ ASEAN peers that the case has no merit, according to diplomats from the 10-nation grouping. Philippines Foreign Ministry officials said Beijing demanded that Manila scrap the case as a condition for a long-planned trip by President Benigno Aquino to a regional trade show in southern China this month. Chinese officials said no invitation was ever offered. The trip never happened. The Philippines’ effort, however, was recently given a boost by a decision from an arbitration panel created to hear the case under the U.N.’s International Tribunal of the Law of the Sea. The five international judges said the Philippines had until March 30, 2014 to produce written arguments about the case’s admissibility and merits. China is a member of the tribunal but has forgone its right to select one of the judges to the panel. Maritime scholar Clive Schofield said the request for the Philippines to provide arguments was potentially favourable. It also meant the case might take less than the three to four years anticipated by Manila when it was launched in January. “It suggests that the Philippines will be able to present its arguments on the merits of the case as soon as the jurisdictional hurdle is overcome…If I was sitting the Philippines’ chair right now I would be happier than sitting in China’s,” said Schofield, a professor at the University of Wollongong inAustralia. He said that it appeared the panel would not be hostile to China even though it was not contesting the arbitration. Ultimately, the Philippines was anticipating a “good return” on its investment, said Storey, the Singapore-based expert. A favourable ruling would give Manila confidence in developing oil and gas reserves in disputed areas such as the Reed Bank. “Foreign energy companies would also feel more comfortable about investing in areas…that lie within the Philippines’ exclusive economic zone,” he said. by Editorial Board | Thanh Nien News – Vietnam and France upgraded their ties to a strategic partnership during Prime Minister Nguyen Tan Dung’s three-day visit to Paris which concluded Thursday,Vietnam News Agency reported. During talks before the signing, Dung reiterated Vietnam’s policy of attaching importance to its relations with France, adding the strategic partnership is not a destination but a new starting point. On the East Sea, internationally known as the South China Sea, the French side supported Vietnam’s policy of settling disputes through peaceful means on the basis of international law, including the 1982 United Nations Convention on the Law of the Sea, and strictly implementing the Declaration on the Conduct of Parties in the East Sea, and quickly creating a Code of Conduct in the East Sea. He received French Communist Party National Secretary Pierre Laurent and met with representatives of France’s leading companies.